Living life as a larger person is not always easy, in fact it’s hard as hell. Especially when you come to terms with you have to try and lose some weight. We all know diet and exercise play a key role in dropping the pounds, but when it comes to choosing what machines to assist in our journey we can be completely clueless. Finding the best exercise equipment for obese people is not an easy task by any means. Especially if you are anything like me and prefer to not showcase my overweight body down at the local GYM or fitness equipment store. Just a couple days ago I was informed of how much weight I had put on by a relative in law which I thought was very rude. But then tells me that I have to lose it blah blah blah. Needless to say i wasn’t impressed and that person is now off my Christmas list. But it did strike a nerve with me personally, I know I am fat and need to wear Big Mans clothes. But I don’t need relatives telling me what to do. Anyways, it caused some inspiration to put together this collaboration of what I believe to be the best exercise equipment for the obese people of the world. Over the years I have learned the hard way that not all equipment is designed to handle high weights. Especially chairs…. But with exercise equipment its a different story because they are a lot more expensive. So checking out how heavy duty and how high the weight capacity is before purchase is an absolute must. We want to use these pieces of equipment until we can comfortably use any machine right?. So it has to be of high enough quality to go the distance. Which is why I have listed the best types of equipment suitable for plus sized people with individual reviews and weight capacities. So lets get into it. 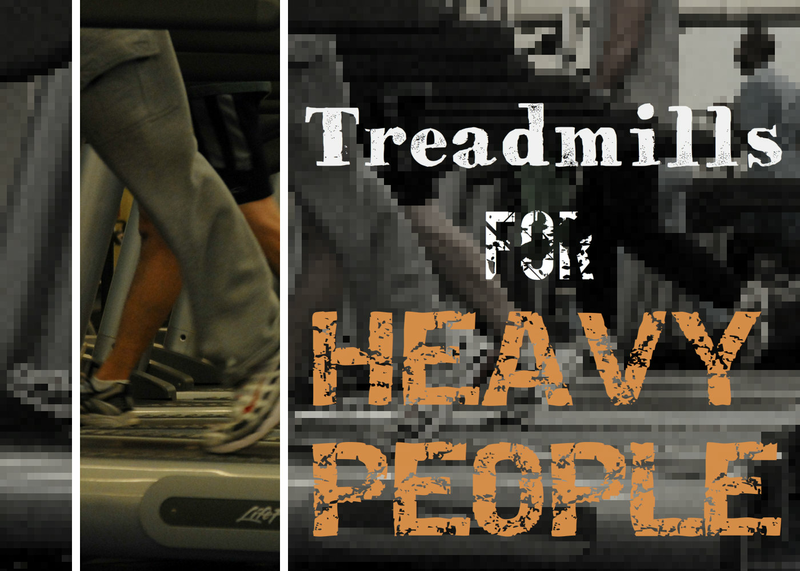 Typical home treadmills are simply not good enough for the heavier person. They are simply not built to withstand such pressure and weights. However the treadmills found at most Gyms are very capable of handling high weight capacities. These beasts can run for many hours straight and take all the abuse you can throw at them. But… Who wants to strut there stuff in a room full of other people, not me. In this guide to choosing a treadmill as a bigger person, you will find treadmills that can handle up to 500 pounds. Which is significantly higher than the typical treadmill you see around the place. 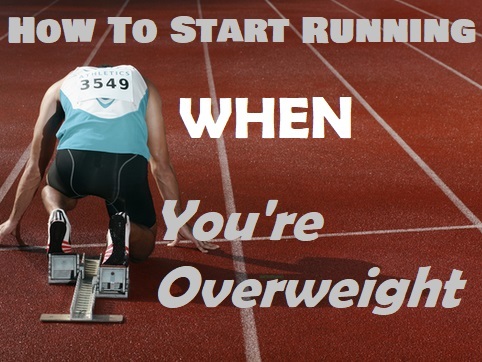 A treadmill is probably the easiest place to start when you are severely overweight. Unless you have some serious joint issues or suffer too much back pain walking. But with the advancements in treadmill technology you can get a lot of helpful data to monitor your weight lose, heart rate etc. Plus some of them even come with cool extras like speakers and USB ports to a desk so you can work while on the treadmill. Which is very relevant to my needs. Soon to be an addition to my home office!. Recumbent exercise bikes are another low impact piece of equipment that is gentle on the knees, ankles and back. While they are typically easier on the body in regards to pain, they don’t generally offer the best workout. Why? Because a recumbent bike will typically work out your lower half of the body due to it’s design. But you can incorporate upper body movement into the workout to make it a full body workout by twisting your hips or holding dumbbells. In comparison to the treadmill, the Recumbent bike doesn’t burn as much fat per workout. But the treadmill is harder wearing on your ankles and legs. So the Recumbent bike definitely has it’s place in the Big Mans Gym, but it may not be the overall body workout you are after. In this collection of Recumbent exercise bikes for larger people you can find varying weight capacities up to 400 lbs. If you weigh under 350 pounds and want a full body workout that the recumbent bike traditional doesn’t offer, then check out the Sole Fitness LCR bike on that page. This model is a dual recumbent/Elliptical machine. It’s a great buy and can offer so many fitness workout options. Exercise bikes are an essential part of the heavy persons exercise equipment. Unlike the Recumbent bikes, an upright exercise bike offers greater full body workouts. But an upright bike does have it’s limitations for the Big Man. As the frame takes more of a pounding compared to sitting on a Recumbent bike, you wont find too many uprights above 400 lbs weight capacity. But for this size range, a exercise bike is probably not the best option. I would rather opt for a treadmill or Elliptical Trainer. If your boy can handle getting over the middle bar of the upright bike and your knee/ankle joints are in OK condition than a exercise bike is a great fit. I find them to be more enjoyable than a Treadmill, but requires more effort at the same time. Typically I use the treadmill n the office to break up long work shifts. 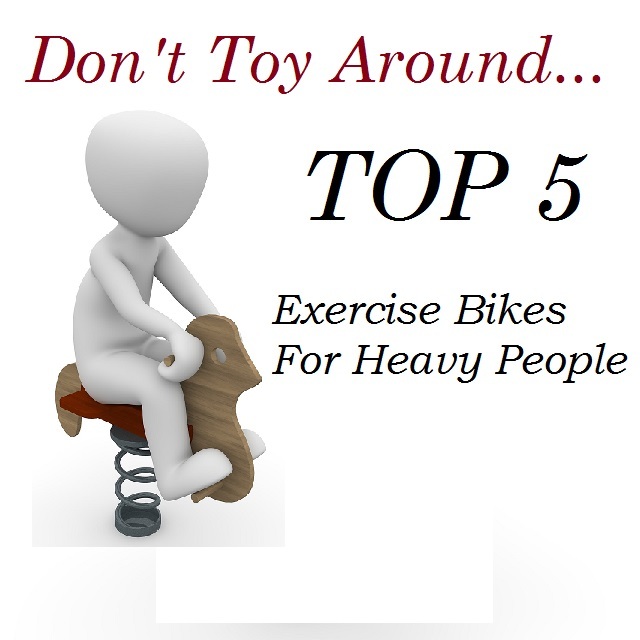 In this article on the Top 5 Exercise Bikes for Heavy People you can compare the best options available to the oversized community. The Sole Fitness B94 is one to keep an eye out for. It’s our #1 rated bike and offers great features VS cost. A very high quality exercise bike with a weight capacity of 300 lbs. Rowing machines are one of the best pieces of exercise equipment an obese person could own. Sure they are low to the ground which could be a problem for some folks, but they are simply amazing at getting results. Like all equipment, rowing machines also come with a weight capacity so it’s very important to pay attention to not only your weight, but the capacity of the rower as well. There’s only 2 Rowing Machines I would recommend to a obese person which can be found Here. Both of these Rowers are built like tanks and have a very high weight capacity. One of them even has a 1000 pound capacity. So you can imagine how heavy duty the construction of this rower is. From my experience with Rowers, I can get about a 80% body workout. Which is just great from just one piece of heavy duty exercise equipment. The Water Rower is my personal favorite because it is motor free. It uses water to power the machine and has a softer more natural feel. Less jolting or jumping actions I found. Trampolines or Re-bounders seem to have been around since the dawn of time, and probably for very good reason. They are Fun!. But they are also a great way to exercise and burn some fat. But as usual, the typical exercise trampoline found in many stores has a irrelevant weight capacity. Meaning we would probably pull the canvas away from the springs upon initial contact. But not these heavy duty RE-bounders/Trampolines. All the trampolines found there are 300 pound weight capacity minimum!. So if jumping your way to fitness sounds like a great plan, then don’t hesitate. Elliptical trainers are amazing machines to say the least. But they can be quite expensive. While they do offer a great all over body workout, are they suitable for the obese and overweight people?. Ranging in weight capacities up to 400 pounds, we have selected only the best suitable Elliptical machines for the bigger persons. While they can be an expensive piece of exercise equipment, we also managed to find the best of the budget range. However, for the complete workout including abs, be prepared to pay more for this unique feature. The Sole Fitness E95 which has a weight capacity of 400 pounds is hands down the best on the market in my opinion. The features, quality and range of options available make working out much easier. Much of it happens almost unannounced to yourself as you workout the rest of the body like a traditional Elliptical trainer. If you can afford to invest in a machine like the E95, then you are in for a treat. Thank you so very very much for your guidance, I’m over 300 lbs and have a COPD which makes it mandatory that I lose weight, besides loving food. Happy New Year, and thanks again for the info. I’m helping out a friend and they are 400 lbs +. So I’m looking for a 500 lbs max capacity stationary bike that has a seat and back rest. I haven’t had any success finding one, and I would really like for my friend to get some exercise and shed weight for the sake of his health. Unfortunately I haven’t come across a exercise bike that has a 500 pound weight capacity. A recumbent bike would be a better fit as it has the wide seat and back rest. The MDX recumbent elliptical has a 500 lbs weight capacity according to their site.